Drilling holes into the ground has never been a clean business. 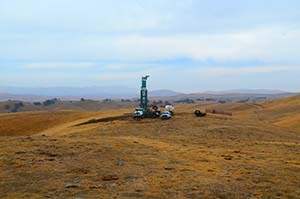 But operating a multi-ton drill rig on a windy ridge far from the amenities of everyday life takes special dedication. Grey drill-mud spatters out of the well. The wind scatters the mud all over the place and covers the drillers and their machines in thick, mucky goo. The noise of the machinery is deafening and the water to keep the mud circulating in the well has to be trucked in from miles away. 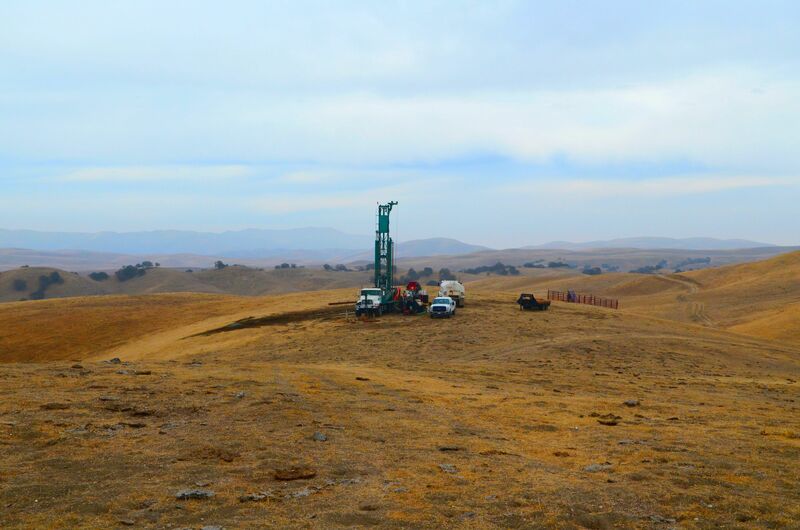 The hole on very remote ranch land in northeastern San Luis Obispo County, that a Livermore based company has just started to drill, is the beginning of a new phase for studying the seismicity along the San Andreas Fault in Central California. Under a contract from the BSL, the company will drill four 1000 ft. deep holes along the fault. These holes are part of a major research program called Tremorscope. 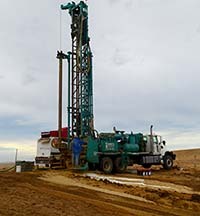 Financed mainly by a grant from the Gordon and Betty Moore Foundation, Tremorscope will allow BSL scientists to investigate a different and hitherto poorly understood type of rumbling of the Earth called seismic tremor. When completed, each hole will be equipped with an array of sensors, all capable of measuring the slightest movement of the ground in various frequency ranges. Most seismic sensors are put into action by installing them in small concrete vaults at the Earth's surface. Hundreds of these tiny vaults dot the landscape of California, especially along the major fault lines. But even far from any signs of civilization, like roads, railways, farms and factories, these surface sensors are so sensitive that they can still pick up movement of the ground unrelated to earthquakes and faults. One cause of what we call seismic noise is the lovely soughing of the wind in trees. It disturbs seismic measurements because the trees transmit the rustling of the wind through their roots into the ground, causing the Earth to shake ever so slightly. Seismometers easily pick-up this surface noise, which can mask the slight shaking of the ground caused by activity on a fault. Going deep underground with the seismic sensors reduces such surface noise and as a consequence, their recordings of seismic signals are clearer. In addition, the deeper one drills into the Earth, the more solid the rock becomes. Seismic waves are much less attenuated and scattered by competent rock than by the loose sediments generally found near the surface. This also makes for a cleaner seismic signal and hence a better chance to study seismic activity.